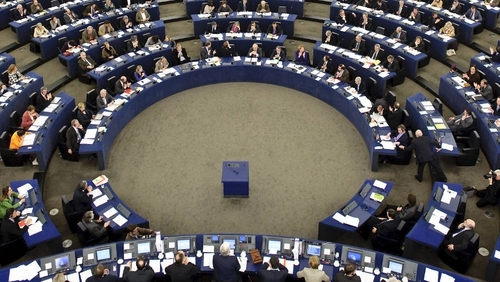 A row has broken out in the European Parliament over Ireland's 12.5% corporate tax rate. It has emerged that eight mostly French and German MEPs have issued a declaration attacking Ireland's corporate tax rate and calling for a minimum EU-wide corporate tax rate of 25%. What has heightened the dispute is the fact that the eight MEPs are all co-ordinators for the different political groupings in the parliament and are, as such, representatives for those groupings on an influential parliamentary committee. The declaration invites signatures from other MEPs and if it can gather the support of 368 MEPs, it then becomes the position of the European Parliament. It goes on to suggest that Ireland's corporate tax rate is unfair and goes against the spirit of European solidarity, especially given the fact Ireland is receiving a bailout. Irish MEPs are understood to be furious at the declaration given that, as co-ordinators on the Economic and Monetary Affairs Committee (ECON), they technically represent the same political groups of which Irish MEPs are members. A spokesman for the influential ECON committee acknowledged the dispute, but insisted that the MEPs had issued the declaration in their personal capacity, and not as co-ordinators. But this has been disputed by Fine Gael MEP Gay Mitchell. It is understood Irish MEPs are to raise the matter with their own political groupings. This morning, the EU Commissioner for Taxation Algirdas Šemeta addressed the ECON committee to set out his work plan for 2011. The European Commission is planning to propose a harmonisation of the corporate tax base. Known as the Common Consolidated Corporate Tax Base, it foresees a single set of rules to clarify in which of the 27 member states multinational companies and SMEs should have their profits declared for taxation purposes. The MEPs declaration was signed by the following: Jean-Paul Gauzes (EPP), Udo Bullmann (S&D), Sylvie Goulard (ALDE), Sven Giegold (Greens/EFA), Burkhard Balz (EPP), Leonardo Dominici (S&D), Wolf Klinz (ALDE) and Pascal Canfin (Greens/EFA). Such a declaration is open to signatures for a three-month period.